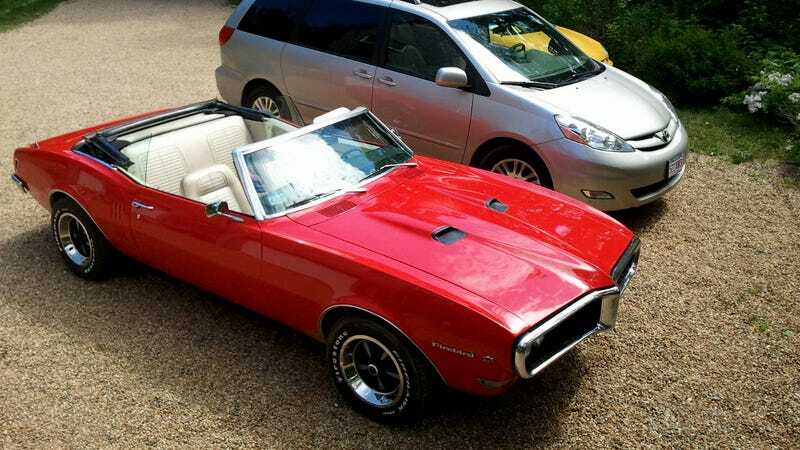 As the 95 of you who read my post from this morning know, I got to borrow a '68 Firebird convertible for the afternoon. Now that the day's done, here are a few random thoughts I had while driving. After driving this, I now regard power assisted disk brakes as a miracle. There are trains that stop faster than this thing. Floor mounted high beam switches are awesome and why don't car makers use them anymore? That thing where you have to step on the brakes to shift out of park was a good idea. 45 year old convertible tops do not seal well at all. Older HVAC controls are confusing as hell. Who on earth would design an electrical system where the headlights dim when you let off the throttle? It is in fact possible to burn through $30 of gas in an afternoon. You could easily lop about a foot off the front end of this thing without compromising the size of the engine bay.